The Syrian regime is conducting a multi-axis offensive against the Islamic State’s stronghold in the Deir Ezzor province in eastern Syria. Russian support, including the negotiation of safe zones and air support, has been essential to the ongoing offensive. The Assad government, along with Iranian-backed fighters and its Russian allies, are advancing from both the west and the north, as depicted in the map above. A victory in Deir Ezzor would be a landmark event for the regime, as its forces have been besieged by the Islamic State’s jihadists at the Deir Ezzor Airbase and the 137th Mechanized Army Base since July 2014. 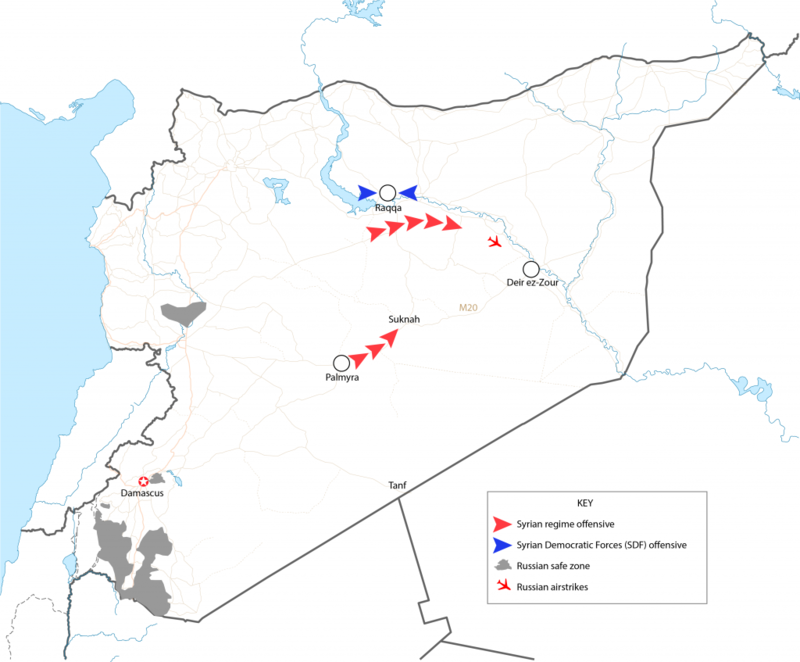 In January, the self-declared caliphate launched its own offensive in the city of Deir Ezzor, effectively cutting the Assad regime’s positions in two. Therefore, turning the tide of battle in Deir Ezzor would be a boon for the regime. Furthermore, the province is rich in natural resources and provides access to Iraq, where other Iranian-backed forces are stationed. The recent Russian safe zones in western Syria have facilitated the regime’s eastern offensive. Russia has implemented three safe zones in western Syria, including one with the United States. According to pro-regime news sources, the safe zones have “freed up tens of thousands of troops”, including the elite Republican Guards. The eastern offensive is likely the intended effect of the Russian safe zones. A Russian military briefing in early May indicated that Syrian troops would advance toward the Euphrates River Valley following the establishment of safe zones. Palmyra: The principal approach capitalizes on regime control of Palmyra in the Homs province to project force eastward towards Deir Ezzor. The regime recaptured Palmyra in March 2017, after three months of Islamic State control. The regime has continued to progress along the M20 highway, retaking Suknah earlier this month. Pro-regime sources describe Russian air support as “imperative” to the Suknah offensive. According to a pro-Assad news source, at least two Iranian-affiliated units are participating in this offensive: the Syrian Army 5th Corp, which includes embedded Hezbollah commanders, and Liwa al-Fatemiyoun, an Iranian proxy composed of Afghan fighters. Raqqa: The regime has also cleared terrain in the countryside southeast of the city of Raqqa, opening a northern approach along the Euphrates. The regime is currently advancing towards the village of al-Jabar, located approximately 55 kilometers southeast of Raqqa. The US-backed, Kurdish-dominated Syrian Democratic Forces (SDF) are presently clearing Raqqa city, which US officials estimate is 55% complete. Russian airpower is supporting the regime, with strikes further down the Euphrates between Madan and al-Tabni. A commander in the region’s elite Tiger Forces assessed that regime forces will reach Deir Ezzor on this axis by early September, according to pro-regime media. Both the US and the Assad regime are attempting to mobilize local fighters to defeat the Islamic State in the Euphrates River Valley. The US is training Syrian militants to operate in the Middle Euphrates River Valley at a garrison in Tanf, a border crossing to Iraq in southeastern Syria. Jaish Maghawir al-Thawra, a US-backed Syrian rebel group, is reportedly in discussions to be transported from Tanf to Shaddadi in order to battle the Islamic State in Deir Ezzor. The regime, however, is mobilizing its own local fighters for its eastern offensive. Tribal fighters, including from the Sunni Shaitat tribe, have mobilized as Suqur al-Furat (Euphrates Falcons) to support the regime’s advance towards Deir Ezzor. According to Al Masdar News, a pro-Assad outlet, Syrian Arab Army (SAA) commander Major General Mohammad Khaddour emphasized the role of the Suqur al-Furat in the Suknah operation. The Shaitat tribe previously rejected the Islamic State’s presence in eastern Syria, resulting in the massacre of approximately 700 members in 2014. As the battle raged in recent weeks, the Islamic State’s media arms claimed that Assad’s forces have suffered heavy casualties. It is impossible to verify the self-declared caliphate’s claims, but the jihadists clearly aren’t going to give up Deir Ezzor without a fight. The organization has moved some of its leaders to the province, prompting a string of targeted airstrikes by the US-led coalition. I’ve got Pizza, I’ve got popcorn, tacos. I’m ready. The Russians will make a movie about this battle at some point. They should air land some Russians on the inside of the ‘kessel’ so that movie will be much more dramatic. Syrian Stalingrad in reverse. I have heard no one complain about American soldiers wearing a big fat red communist star on their shoulders while wearing the YPJ patch. The siege is almost over. This is the loss of all Sunni population in Syria. Because the terrorists came from outside found strongholds within sunni populations. Now the Asad Regime us targeting the strongholds of IS. But surrounding sunni civilians are also being destroyed. Same happened in Sawat city if Pakistan. The regime can probably take Deir Ezzor once they link up with the airbase. The Russians will flatten whatever parts IS is holed up in. The regime can probably muster the soldiers to get that done. Clearing the rest of the Euphrates valley is not something that can be done without a coordinated effort from all sides against IS. The only way the fighting doesn’t drag on for another couple years is a complete collapse by IS. Deir Ezzor is an airbase under Syrian control. The airbase has been under siege for years now. The city is controlled by IS. update: The siege has been broken, battle is progressing on all sides against IS. The regime requires an investment from Iran and Russia. The Syrian Arab Army is pretty depleted after a long civil war and defections of about half its original strength. DeZ isn’t going to be easy to take, furthermore, the original people of DeZ liberated the city very early and do not view the regime as better then IS. What would happen if Trump cuts a deal with Russia and Assad against IS and Iran? The Kurds would get their state and Jihadi Turkey would be powerless. Iran would lose not only its elite forces, it would lose the most important strategic position except for the Strait of Hormuz. Hizballah would be weakened and who knows what that would mean for Lebanon to turn the corner. IS would be crushed fast. The sunnis in Syria would be safe and Israel would have another neighbour that is not openly hostile. The downside? Ah yes, a dictatorship in a country that will never be democratic anyway. What should Trump do? Yes, that is a rhetorical question because of course he could cut a deal with Assad. The Syrians will never abandon the Iranians, they saved them. Russia too probably. Abandon is emotional language. If Assad gains legitimacy, a powerful sponsor, and guarantees he will jump at the chance to escape the mess. No, he will not. Look at his most recent speeches. Iran in particular has invested lots of blood into the conflict. Assad is a shell of himself and he will be in debt to Iran if he does end up in power. Furthermore, the US cannot “cut deals” with warcriminals like Assad. They might acknowledge he is likely to stay, but that doesn’t mean they are happy about it. Assad is winning. Under Assad even Jews lived in Syria without being killed. In your world there are two scenarios: Assad wins with Russia’s and Iran’s help and is their puppet. Assad loses and jihadis start combatting each other. We seem to both agree that Assad will win and I believe you also think that is better than scenario 2. You write “cannot” but mean “should not”. In my scenario, of all the bad guys only the least bad wins and all the other bad guys lose badly. That didn’t take long. The regime has made it to the city. Islamic state has lost too many resources and can no longer counterattack effectively. IS has no choice now except to head down the Euphrates to Maydin and their last stand.